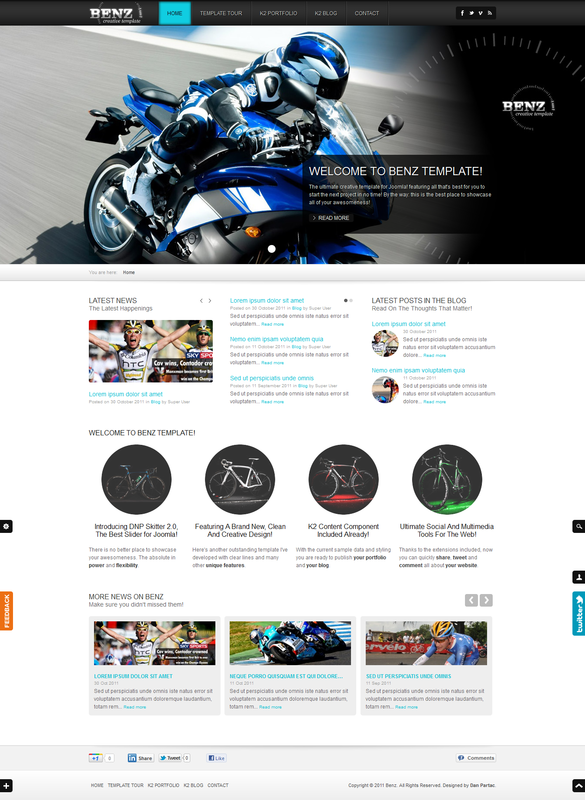 The template is really tested in major browsers, and comes with REAL Quickstart Installation Pack for Joomla! 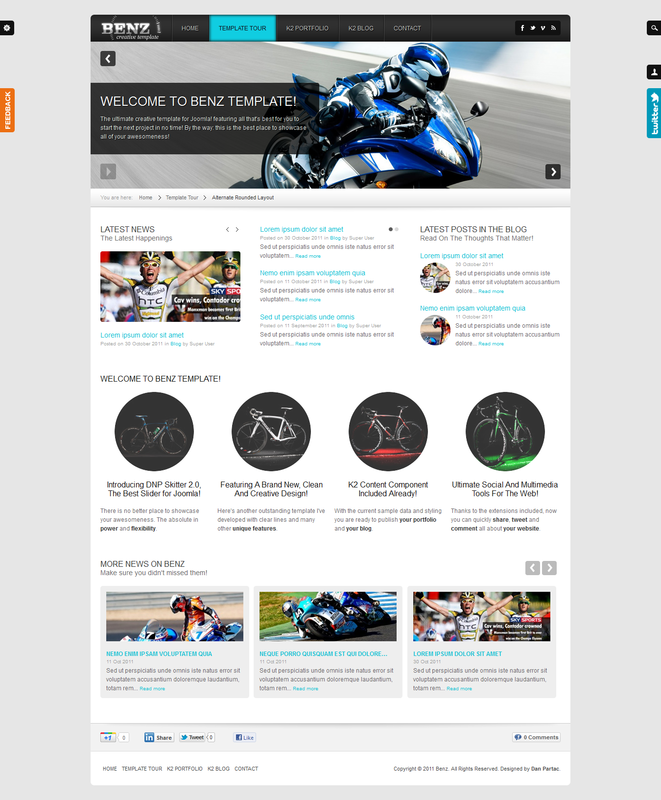 2.5, various extensions and PSD Sources for various graphics used on the demo site. I am constantly updating all my templates so please redownload the latest version and check the changelog in the documentation. 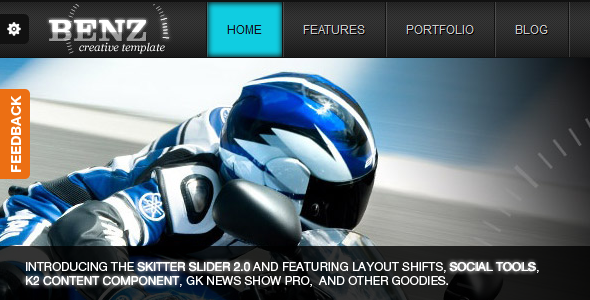 The Best Slider called Skitter Slider Module. You will love it! Sticky AJAX Search Module with a unique look and feel. Awesome Social Sharing and Pop-up Facebook Comments applied to all pages and / or each Joomla! content article. Awesome TwitterShow with Right Side Toggle. Unique Login Register Module with Right Side Toggle. Unique Feedback Module with Left Side Toggle. Alternate Round Layout with awesome sample home page. Google Maps Plugin to spice up the contact page. Custom Form Elements – another unique feature powered by CSS3, to add more style to your checkboxes and radio boxes. 7 color variations: blue, marine blue, red, pink, green, orange and yellow. Custom error and offline pages. Beautiful CSS3 powered typography with 2 styles price tables, bubbles, blockquotes, lists and everything you need for your content. jQuery 1.7 minimized included & running in “no-conflict” mode for various template features. Friendly Administration Panel: now you can do everything inside the module, without having to do XML editing. SEO Friendly: the new built in functions fixes images links automatically. Multi-slide: for each slide you can set 3 animations, one for the main image, and 2 more sequences. Progress bar with all possible positioning presets. Play/pause button with all possible positioning presets. Various navigation options (menu, dots, thumbs) with all possible positioning presets. Slide preview for dots navigation. XML load capability for more than 10 slides or more than 1kb slides content. 38+ animation types for slide image. CSS3 animations for slide content with randomize options. 8 animation types for slide descriptions. Stops on window focus out to save CPU power UNIQUE. Featuring a fully responsive, retina ready and clean design, the best responsive slider for Joomla called DNP Slider and the best portfolio/media filter called DNP Portfolio. Check it out now! Featuring JomSocial with fully responsive and clean design, the best responsive slider for Joomla called DNP Slider and the best portfolio/media filter called DNP Portfolio. Check it out now!